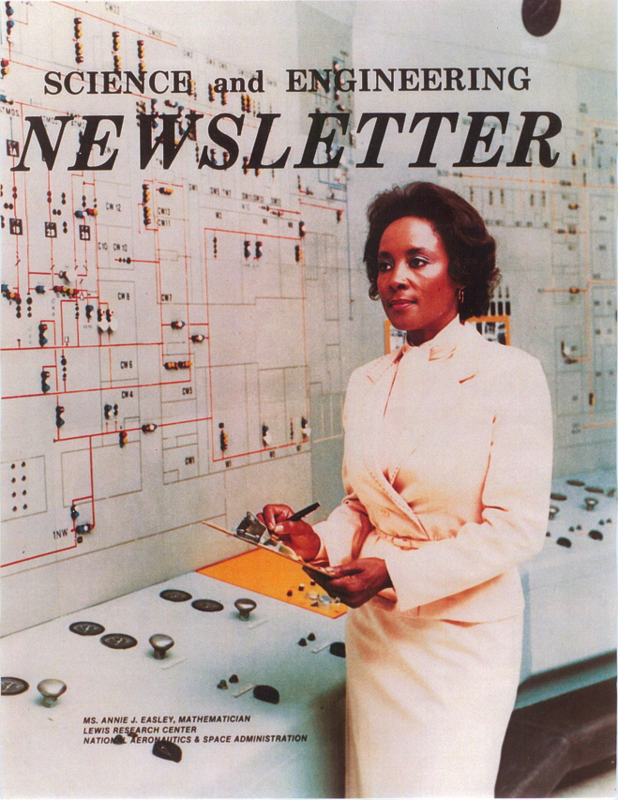 Annie Easley – African American History Month 2017 #BlackHistoryMonth « Adafruit Industries – Makers, hackers, artists, designers and engineers! …In 1955, she read a local newspaper article about a story on twin sisters who worked for the National Advisory Committee for Aeronautics (NACA) as “computers” and the next day she applied for a job. Within two weeks she was hired, one of four African Americans of about 2500 employees. She began her career as a mathematician and computer engineer at the NACA Lewis Flight Propulsion Laboratory (which became NASA Lewis Research Center, 1958–1999, and subsequently the John H. Glenn Research Center) in Cleveland, Ohio. She continued her education while working for the agency and in 1977, she obtained a Bachelor of Science in Mathematics from Cleveland State University. As part of a continuing education, Easley worked through specialization courses offered by NASA. Her 34-year career included developing and implementing computer code that analyzed alternative power technologies, supported the Centaur high-energy upper rocket stage, determined solar, wind and energy projects, identified energy conversion systems and alternative systems to solve energy problems. Her energy assignments included studies to determine the life use of storage batteries, such as those used in electric utility vehicles. Her computer applications have been used to identify energy conversion systems that offer the improvement over commercially available technologies. She retired in 1989 (some sources say 1991). Easley’s work with the Centaur project helped as technological foundations for the space shuttle launches and launches of communication, military and weather satellites. Her work contributed to the 1997 flight to Saturn of the Cassini probe, the launcher of which had the Centaur as its upper stage. Annie Easley was interviewed in Cleveland, on August 21, 2001 by Sandra Johnson. The interview is stored in the National Aeronautics and Space Administration Johnson Space Center Oral History Program. The 55 page interview transcript includes material on the history of the Civil Rights Movement, Glenn Research Center, Johnson Space Center, space flight, and the contribution of women to space flight.